This was no ordinary smart device. The Nest Thermostat gave us a sense of power, control, and freedom. And it said “hi” to us with its shining light as we approached. The best thing was the money we were saving by lowering our electricity bill, because we could now make sense of how we were using our air conditioning. This also helped reduce our carbon footprint. 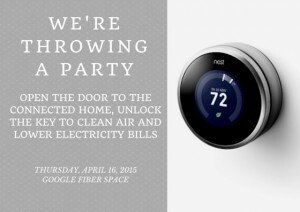 @EDFtx is throwing a party w/ @CleanTX @Nest and @googlefiber, and you’re invited! Come discover the power of the connected home. We were hooked. Research shows that once a consumer has one smart device, there is, on average, a 50 percent chance the same household will acquire another device within a year. We were living proof. Shortly after we installed the Nest Thermostat, our garage door opener broke and, of course, its replacement happily joined the connected family. I now get a text each time our garage door opens, which sounds annoying, but at 3pm every school day, I get peace of mind knowing my daughter arrived home from school. In fact, a new study by Greentech Media indicates peace of mind is the number one reason people buy smart home devices, followed by comfort and convenience as well as energy management. Smart connected homes have engaged our imaginations since the days of watching the Jetsons. Thanks to the Internet, this societal dream is turning into a reality and serving as a central driver in the transformation of the energy industry. From iPads and Xboxes to Nest Thermostats and wifi-enabled dishwashers, the number of devices in a home is increasing – and changing the way we interact with our homes in ways you might not expect. That’s why Environmental Defense Fund, Google, Nest, and CleanTX are hosting an event on Thursday April 16th to explore what it means to live in a connected home, how it can help reduce Austin’s carbon footprint, and which energy-saving products are already flooding the burgeoning home cleantech market. Join us at the Google Fiber location in downtown Austin for a dynamic conversation with Austin Energy, Pecan Street, Nest, and Environmental Defense Fund, with CleanTX moderating, to discover the many benefits of a connected home, including lower electricity bills, cleaner air, and reduced waste. Guests will also have a chance to explore the new Google Fiber space and network over hors d’oeuvres and an open bar. Bert Haskell, Chief Technology Officer, Pecan Street Inc. Image provided by Nest Labs. 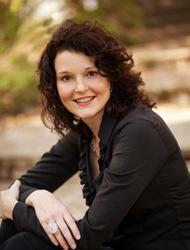 This content originally appeared on EDF’s Texas Clean Air Matters Blog. This entry was posted in Grid Modernization, Texas and tagged Google, Nest. Bookmark the permalink. Both comments and trackbacks are currently closed.